Formed five years ago to present a small-but-perfectly formed La Bohème in a room above a Kilburn pub, OperaUpClose has gone on to have great success with pared-down versions of Carmen, Tosca and Don Giovanni. Following the company's award-winning template, this Traviata does away with extravagant party scenes and gypsy choruses, and confines the action to one room-sized set populated by just five singers and three musicians. The result is an intimate production with the performers thrillingly exposed and Verdi's music firmly centre-stage. The action has been transplanted by director Robin Norton-Hale from 19th century Paris to Gatsby-era USA, with flapper dresses and cocktails replacing corsets and chandeliers. Socialite and courtesan Violetta embarks on a doubly-doomed love affair with young noble Alfredo; parental meddling, tragedy and tuberculosis ensue. Dumas's narrative celebrates the very particular melodramatic pleasures of thwarted love and beauty dying young; Verdi's soaring score wrings every last ounce of sentiment from the scenario. With no set and no orchestra to hide behind, the production leans heavily on the talents of its small cast (or rather casts — there are three performing in rotation). Tuesday's Violetta, Louisa Tee has a supple, shimmering voice that easily rides Verdi's emotional swoops and runs. There are strong vocal performances, too, from Flora McIntosh (Flora) and James Harrison (Germont). As Alfredo, Lawrence Olsworth-Peter lacks the resonance of his fellow cast-members, and takes a few scenes to find his pitch; with Tee outclassing him every time she opens her mouth, the pairing doesn't make complete sense either vocally or narratively. Special mention must go to the "orchestra" of three instrumentalists; the chamber-style arrangement of Verdi's score was a delicate treat. Theatregoers who have previously been put off opera by its reputation for histrionic bombast should give this production a go. Lavish productions in large opera houses require the cast to project towards the back of the amphitheatre rather than emote naturally; by letting the audience come closer to the stage and the performers in physically intimate theatre spaces, OperaUpClose lets us come closer to the dramatic essence of its narrative. 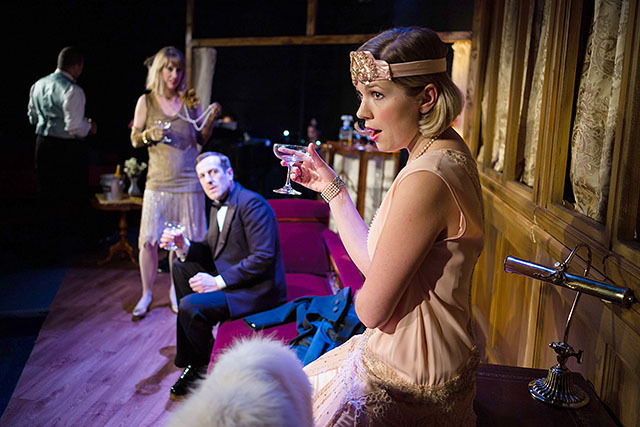 La Traviata runs at Soho Theatre until 14 September. Londonist saw this show on a complimentary review ticket.